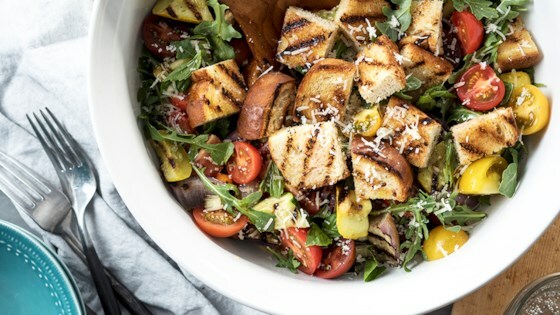 "Turn multigrain bread into the star of this summer vegetable panzanella, an Italian-style bread salad featuring juicy tomatoes, grilled zucchini, eggplant, and arugula." Grill zucchini, yellow squash, eggplant, and red onion, covered, on grill rack, directly over medium-high heat for 6 to 8 minutes, or until tender, turning once halfway through grilling. Remove vegetables and set aside to cool slightly. Feel free to use cherry tomatoes. Awesome recipe! I did alter a bit by using garlic infused EVOO and thyme..a real hit..